Can anyone tell me the value of R1 on the control 24 power supply board? (the skynet version) - I've been asked to attempt to repair one and R1 has obviously blown, to the extent that I can't read the details off it. I've attached a photo. 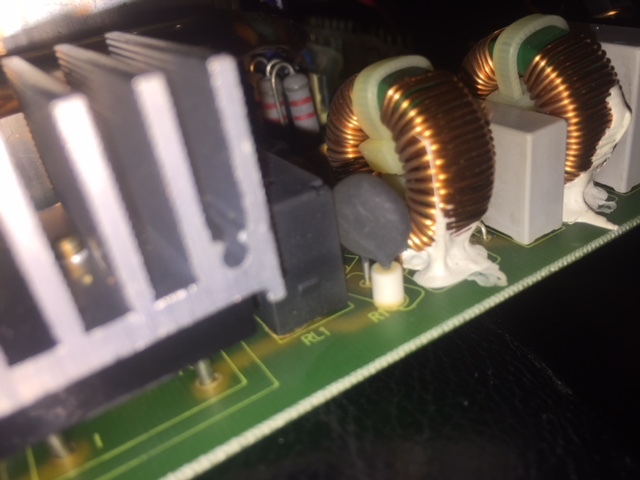 I realise the resistor is likely to be a symptom rather than the cause of the failure but all the other components appear ok, from a quick visual inspection. Ive got a spare in front of me but there's no way to view any values on it, ive tried close up photos from both sides but nothing viewable i'm affraid. Unless i can somehow measure mine for you. Ive got various documents for the control 24 but no schematic unfortunately. If you have a multi-meter available to you, and could test the resistance of R1 that would be immensely helpful. Ok i tried to measure it on the boards obviously. It seems to be a Varister not a resister... google search suggests it should be removed to read correctly. my meter reads at 200 or 2000 and at the 2000 settings it is showing variable resistance but seems to favor around .400 to .500 but it does move around a lot. Thanks for that. Can you confirm that the one in your board looks similar to the blown one in my picture? if it does then I think it's a 10SP010 Thermistor to limit inrush current. Thanks for that, I appreciate it. It does look similar, however having replaced it with what I thought it was i'm still blowing fuses and have blown another thermistor. They did the repair in a week for £95 plus carriage and vat, just took the supply out the Control 24 package it up and sent it to them. Came back packaged better than I sent it.